There is a habit that we would all benefit tremendously from losing. It is The Habit of Self-Pity and no good has ever come from its use. This habit is so draining, so damaging and so restrictive that it’s very presence can cause paralyzing inertia. This habit, perhaps more than any other, has destroyed hope, prevented happiness, eliminated resilience, prolonged stress and misery, and drained energy from all who utilize its power. So powerful is its hold that it requires the strongest of will to break free from its grasp and, unfortunately, all too often those unable to do so will succumb to its powerful presence. It lures its victims through its ready availability and its ease of access. Self-pity, more than any other habit, will bring great plans to a screeching halt, shatter dreams and shred all aspirations of greatness. It so severely narrows our field of vision that when we are in its grip, we are able to see only doom and future despair. It robs us of our ability to be aware of all our available choices and allows us only to choose from a limited menu of poor ones. If it is true that within all adversity lies seeds of opportunity, then The Habit of Self-Pity hides those seeds from view and robs us of the resourcefulness we need to seize that opportunity and use it to convert hardship into victory. We then commit our available energy to answering these questions and focusing solely on our problems instead of possible solutions. While in the state of self-pity we become stress-producing factories. Our cortisol levels rise, as we focus intensely on the severity of our challenges. There is no poison more harmful than self-pity, but there is an extremely powerful antidote that, when taken as prescribed, will instantly reverse the damaging effects and allow hope, energy and possibility to flow through us. It is a miracle drug; the effects are immediate and instantly transform us from a state of hopelessness to one of inventiveness. Rarely do our problems result from a lack of resources, most often they are from the absence of resourcefulness. We spend our time directing all our energy and attention to the problems at hand and, just like great fishing stories, those problems get bigger and the consequences grow more dire with each retelling. So, what is this magic drug? It is known by its generic name, “Positive Focus,” and a single dose can immediately redirect attention to finding solutions, planning courses of action and, most often, reversing the most difficult of tests that life frequently plants on our pathway. The Habit of Self-Pity is a tough adversary. It too uses focus to drag its victims down into the miserable abyss called Despair. The difference is that it uses Negative Focus – the deadliest poison known – as its principle ingredient. The wonder drug, Positive Focus, utilizes the long-known secret that energy flows to where attention goes to redirect attention and trigger problem-solving and solution-creating. And when we do this – when we change our focus to one of positive creativity – everything changes within us. Our entire lives centre around our present focus. What we are focusing on in this minute is who we are in this moment. sWhen we are enthusiastically seeking shovels with which to dig ourselves out of holes, shovels miraculously appear wherever we look. As we start seeking and finding solutions, we become energized and inspired and soon we begin to take all the action necessary to overcome our current problems and turn them into joyful victory dances. You may recall past discussions in which we have confirmed that habits can’t be killed off, they can only be replaced by new ones. 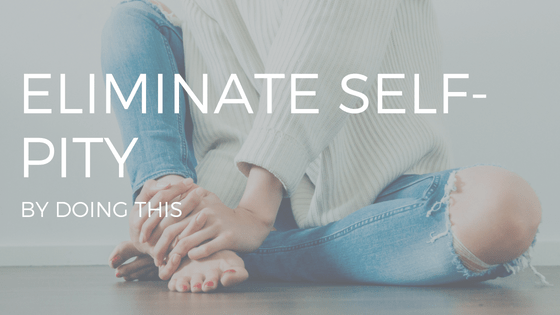 The best way to send The Habit of Self-Pity to live out its days alone and unwanted is to take a healthy dose of Positive Focus the instant self-pity rears it’s pathetic head. In fact, it is well known that several daily doses of Positive Focus adds joy to the soul and years to your life. And Positive Focus has no harmful side effects.